This morning, as I opened up my blogger account to post a photograph of gluten-free pasta, preparing to write a post, I discovered something: this is my 200th post. 200. Two hundred. Eight twenty-fives. Two hundred x one post = 200 posts. As those of you who have been reading for awhile must know by now, I love doing this. I adore writing  that sliding feeling of my fingers on the keyboard, tapping out a rhythm. But more than that, I love this ineffably beautiful process of telling stories and sharing my world, or at least a little sliver of it. I dont always know where I am going, but I follow that small, still voice that points, This way. At the end of every piece of writing, I find myself somewhere I did not know existed before. And I am at peace. One of my friends said to me yesterday, You are so open. You really just dont hold anything back in those posts. Yes. Thats true. She is not the only friend to say this. Sometimes, friends look at me in astonishment after reading a post, and say, I cant believe you revealed that. I dont know. I actually dont know how to do it any differently. You see, after a lifetime of struggles and joy, a terrible car accident, going gluten-free, and` many years of meditation, I have learned this: I want to be authentic. We are not here for long. I want to really be here, every minute that I can, for that brief amount of time. Thats what I love about writing  a gay man writing about the results of his coming out can speak for me. I think of these ideas every day, particularly as I am constructing a book, and working against a big deadline. Am I telling the truth in every sentence? Im telling my truth. But if sometimes the details are different from how it actually happened, then the sentence becomes the way I see it. Every day, I understand my own life more fully by diving into words and trying to come up to the surface with something solid for you to see. Is the self you are reading the real me? Not wholly. But it is my best self, the one I strive to be, and the one I feel like most of the day, these days. One of the greatest joys I experience, every day, is reading the comments on this page, and the letters you send me after reading this site. Every day, I am moved by your kindness, your insights, and the ways you say that I have inspired you. Believe me, please  that means the world to me. Writing is a solitary, difficult act. If I have moved you by telling my story in these two hundred posts, slowly unraveling the life I love through food, then I am deeply honored. That is why I keep going. That is why there will be a book next fall, why there will be post #201 tomorrow. And now, Im going to celebrate by eating some carrots. After all, carrots are gluten-free! I’m new to your blog but I can’t wait for the next 200 posts 🙂 Great work!! I just don’t know any other way to be either. 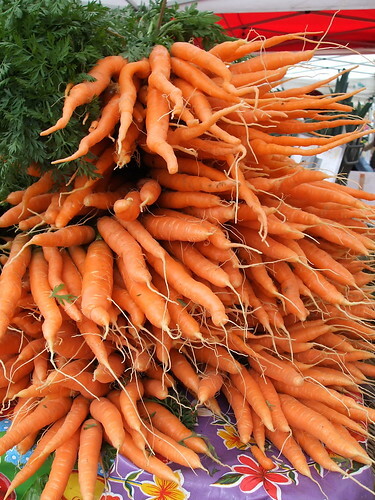 those carrots look like legs, like a camera in an underwater shot of a synchronized swimming team. You are 8 X 24-carrot gold + 8 more for good measure. I adore your blog, and you, and your chef. congratulations– what a wonderful feat! Here is to more of your writing enter the world and making it better for all those who read it! I guess that’s 200 times you’ve made me smile. Keep up your amazing wonderful work (does blogging fall under work or play?). You are an inspiration! I’ve been blogging only for a couple of months…and people, especially friends, have told me “how personal” it is, how “brave” I am…I’m always kind of taken aback by that. I write about my experiences and my thoughts because I think, no,I believe someone else in this world gets what I’m writing. Just gets it, right in their soul. And that “communion” is worth every drop of sweat, tears, agony of writing. I’ve come to believe contentment is when my soul and my skin are meshed together, at the surface of me – as you say, that’s when the truth is out – me as me. In my low times of life I feel my soul shrinking away from my skin – love (my Steve) and getting older (also over 40, in the land where nouns disappear) seems to have brought soul and skin together again. And so I’ve embarked on writing again..because I really like the person in that blog…and guess what? It’s me. As you say, the best of me. What a privilege eh? Thank you for coming by! It’s amazing how quickly 200 posts go by. I can only wonder where my life will be then. I’m so glad there are pleny of us out there. We have too many closed-off people around. Let’s open. That is a damned hilarious observation. And accurate. I can’t see anything else now that you’ve mentioned it! Your husband sounds adorable. And I’m happy that the kitchen is improving. Oh goodness, buckwheat crepes. Well, we could work on them, but we have such a long list of recipes to make in the next six weeks! I think that Rose Levy Bernbaum has a great gluten-free recipe in one of her books. She also has a baking blog: http://www.realbakingwithrose.com/ She might be able to answer your question right away! Thank you! So good to see you here. You are right about coming out. Whatever we withhold (or is withheld from us) takes on extra power. It’s such a release to know about my celiac. I can hardly believe what has happened to me since! Thanks for reading, as always. Thank you, my dear. I’ll do all that I can. And you keep up the hard work in law school. As soon as this manuscript is finished, we must have some food again. Blogging is play. So is writing. I can’t believe someone is actually paying me to do what I love! And you always make me smile, my dear. Thank you. I love that line, “…when my soul and skin are meshed together.” Good work.